Sweet and savory goodies for that special person! 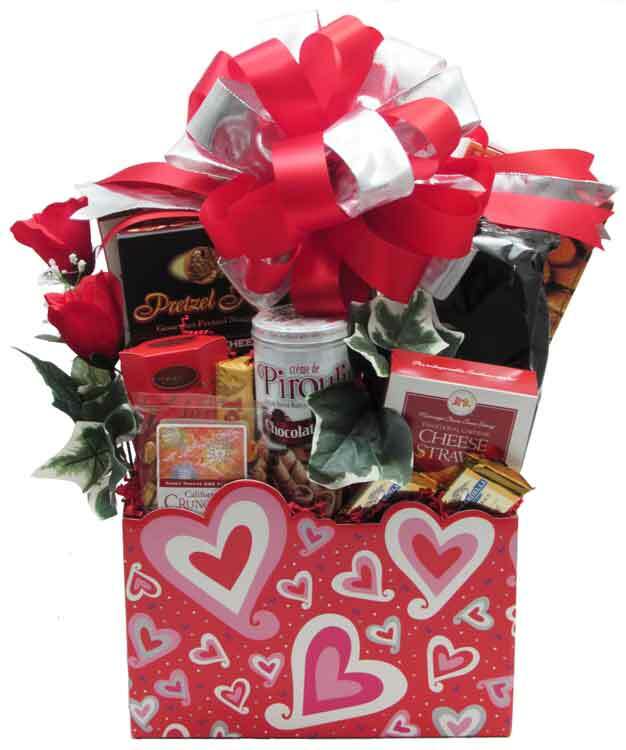 This beautiful gift basket arrangement is as wonderful looking, as what inside is tasty! Wrapped in crisp clear cellophane and topped off with a big beautiful handmade bow. We've added Silk Flowers & Greenery. Includes a Handwritten Greeting Card. We add a heart shaped box of Russell Stover's Valentine Assorted Chocolates for Valentine's Day! Finished wrapped design for hand delivery, approx. 20H" x 12W" x 7" D (Large container 9.5"L x7"d x6"h). Add balloons or a Plush animal! Choose your selection at check out! MORE SWEET THAN SAVORY: Filled with a box of luscious Chocolate Truffles, Nuts, Toblerone Swiss Milk Chocolate Bar with Honey & Almond Nougat, Chocolate bottomed Biscotti (2), tin of Piroulines Chocolate filled Wafer Rolls, Ghirardelli Chocolate Squares (2), Cheese Straws, Gourmet Popcorn made right here in the Dallas area! (Almond Pecan Crunch, Cranberry Walnut Crunch, Dark Chocolate with Sea Salt, or Caramel & Cheddar Jalapeno), Pretzel Twists (Smoky Barbeque, Cheese Pizza, or Salted Caramel), and a box of Peanut Brittle. A BIT MORE SAVORY THAN SWEET: Filled with Nuts, Sliced Natural Hickory Smoked Beef Summer Sausage, tin of Piroulines Chocolate filled Wafer Rolls, Ghirardelli Chocolate Squares (2), Cheese Straws, Cheese, Gourmet Popcorn made right here in the Dallas area! (Almond Pecan Crunch, Cranberry Walnut Crunch, Dark Chocolate with Sea Salt, or Caramel & Cheddar Jalapeno), Pretzel Twists (Smoky Barbeque, Cheese Pizza, or Salted Caramel), and a box of Focaccia Crisps Crackers. NOTE: Limited quantities. We are out of silver ribbon. The bow will be made with big red #40 satin ribbon.